SAML Identity Provider is an app in the UCS App Center which provides SAML functionality. SAML is an XML-based open standard data format for exchanging authentication information. It enables web-based authentication and authorization scenarios including cross-domain Single Sign-On (SSO). The app is based on SimpleSAMLphp which implements SAML 2.0. The app allows the configuration of an identity provider which can be used to authenticate and authorize users who wish to use external service providers. This allows domain users to use external services with their domain credentials as a Single Sign-On (SSO) solution. SAML Identity Provider is available through the App Center and can be installed using the corresponding UMC App Center module. The SAML Identity Provider app can be installed on a domaincontroller master or domaincontroller backup. 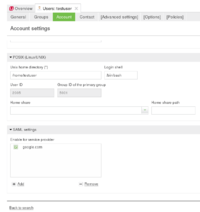 The SAML identity provider is configured with a Univention Management Console module of the same name. Users are configured to use a service provider in the Univention Management Console Users module. By default no user is allowed to use any service provider. Users can be activated by adding any configured service provider on the users 'Account' tab in the section 'SAML settings'. Service provider identifier: The identifier with which the service provider is recognized at the identity provider. Respond to this service provider URL after login:	The URL of the AssertionConsumerService metadata endpoint for this service provider. Users will be redirected to this URL after authentication. The checkbox Service provider activation status has to be enabled to activate the service provider configuration. If it is deactivated, the login to the service provider is not possible. If additional user attributes are to be sent to the service provider, their format (e.g. urn:oasis:names:tc:SAML:2.0:nameid-format:email) and the name of the attributes must be set on the Extended Settings tab. 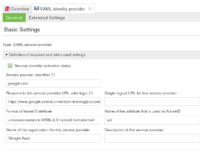 Open the testshib.org service provider entry in the UMC SAML Idendity provider module. 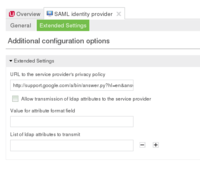 Active the service provider by enabling the respective checkbox on the testshib.org configuration page in the SAML identity provider module and save the change. Save this page which contains metainformation as a file on your hard drive. You will be redirected to the Single-Sign-On page on your Univention Corporate Server. Enter the credentials of a user that is enabled to use the testshib.org service provider. You will now be redirected to testshib.org, where additional information about the successful login will be displayed. In this example google apps is configured as a service provider for single sign on of domain users. A valid (test-)account of google apps is necessary to follow this example; its creation is beyond the scope of this article. In this howto section the configured google apps domain is TESTDOMAIN.mygbiz.com. Whenever this domain is mentioned, it should be replaced by the domain configured for your test environment. First, a testuser should be created inside the new google apps account, which has to have the same username as the UCS user that will be used to test the service provider (e.g. testuser). The last check-box defines which issuer or identifier will be send to the identity provider. If not checked, google.com will be send as the identifier, which works for our example. After saving the changes, the service provider can be configured on the UCS server. We need the URL of the Google apps account domain (e.g. TESTDOMAIN.mygbiz.com). In the SAML identity provider module the google.com entry has to be opened. The check-box Service provider activation status must be enabled. After that, the URL in the field Respond to this service provider URL after login must be updated with your Google apps account domain (e.g. TESTDOMAIN.mygbiz.com). The changed have to be saved. - Via the google apps login page: Use a webbrowser to navigate to the following URL, enter testuser@TESTDOMAIN.mygbiz.com and click on Login. The browser should be redirected to the single sign on page. - Directly from the identity provider. The session starts at the identity provider by adding the service provider information as parameters to the URL. Point the webbrowser to the following URL, where the authentication webpage is presented to the user. On the identity provider login page enter the local username and password. After successful authentication and authorization the browser will be redirected to the Google apps dashboard, already logged in with the testuser. In case the login process to a service provider should be initiated from the Univention Corporate Server, the following URL can be visited. The service provider identifier equals the value entered in the service provider configuration. UCR variables control the basic behaviour of SimpleSAMLphp. The most important are mentioned here with descriptions that are helpful to understand SimpleSAMLphp's configuration. saml/idp/certificate/certificate:	The service provider needs to know if the SAML message with the info about successful originates from the correct identity provider. The SAML message is therefore cryptographically signed by a public-private key pair. This UCR variable contains the path to the public part of that key pair. During installation of the SAML Identity Provider app, new keys are generated. If you change these keys the current public key has to be uploaded to service providers. saml/idp/certificate/privatekey:	The path to the private key used to sign messages to the service provider. saml/idp/technicalcontactname:	The name of a helpdesk contact which is shown to the user when he encounters problems with the identity provider. saml/idp/technicalcontactemail:	A contact email address which is shown to the user when he encounters problems with the identity provider. To test or debug the current settings, set the UCR variable saml/idp/log/debug/enabled to TRUE. The loglevel can be configured with the UCR variable saml/idp/log/level, which is set to NOTICE by default. For debugging purposes INFO or DEBUG can be used. The debug output can be found in /var/log/syslog. This page was last edited on 2 August 2018, at 11:11.